On Friday, July 3rd we invite all people interested in human and minority rights to the Presentation of Research Reports by HIA Fellows. Each presentation will consist of summary of findings and time dedicated to Q&A. The best presentation will be shown again during the closing session of all 5 national HIA programs in Paris between 5th and 8th July. Opening: During “Open Day” on June 21st at the Office of the Commissioner for Civil Rights Protection, fellows met with Commissioner Janusz Kochanowski and Director of Constitutional Rights and Spokesman of International Civil Rights Mirosław Wróblewski. The speakers shared with the fellows how their office works to protect human rights in Poland and what they envision for the future. Today was “Open Day” at the Office of the Commissioner for Civil Rights Protection. The public was free to visit the office, find information, and ask questions at the information booths. Commissioner Janusz Kochanowski was very gracious to take time from his busy day to talk with the Humanity in Action fellows and answer their many questions. The Commissioner for Civil Rights Protection is appointed by the Sejm and approval by the Senate. His mandate is to protect the civil rights and liberties of citizens by working as an independent intermediary between the people and government. Although the Commissioner represents all citizens, he devotes special attention to sexual minorities and to the one to two percent of the population that are ethnic or national minorities. Fellows gathered in the same conference room in which the Commissioner invites minorities to join him to voice their complaints and suggestions. During his lecture, Kochanowski outlined his opinions and project plans for the Roma, Jewish, Vietnamese, Chechen, and LGBT minorities. Several topics he discussed were Roma education problems, Chechen integration issues, anti-Semitism in the Polish Football Association, and Jewish cemetery vandalism. He also talked about his plans for reforms to the judicial system, which he claims simply “doesn’t work,” and reforms in the legislative process. Throughout the presentation, he stressed the importance of keeping stories in line with the truth and keeping problems in perspective. He reminded the fellows to not judge an entire country or group based upon the behavior of a boisterous few. Needing to return to the “Open Day” events, Mirosław Wróblewski took over for his boss and continued to discuss with the HIA fellows. Wróblewski has seen a doubling of the amount of complaints and pleas for help from the community since he joined the Office of the Commissioner for Civil Rights Protection. He believes that one of the main issues for such a large number of contacts (over 60,000 per year) is the failure of access to legal advisement. In a first step toward fixing this, the Office has just opened a new and informative website for the public to use. He told the fellows that access to legal information and advisement must improve, but that also it is important to do something about an injustice one suffers or witnesses, not only to report it. After discussing the issues of counter-terrorism security and the role of the Office to aid football fans when they believe their rights have been violated, Wróblewski closed the talk with the message that while we must fight terrorism, vandalism, and bad behavior from the football fans, we must not sacrifice our democracy or civil liberties in the process. FRIDAY, June 19th. Within the bigger framework of the second part of Warsaw’s HiA program, which explores the present status of human and minority rights in Poland, this day was fully dedicated to the situation of migrants in Polish society. Dividing the day into three major parts, we first elaborated on Persons seeking protection in Poland on the basis of a presentation given by Agnieszka Kosowicz from the Polish Migration Forum. Then we looked at the Vietnamese minority as a case study guided by Dr. Teresa Halik from the Institute of Oriental Studies before we finally summed up the day by means of an active Fellow’s Discussion. Is Poland ready for multiculturalism? This was the leading question put on the floor by Mrs. Agnieszka Kosowicz in her speech on refugees and migration policy in Poland. In order to better grasp the whole dimension of migration and integration in Polish society, she stressed the international context and global interdependencies of the topic. Since Poland has signed up the UNHCR Geneva Convention on Refugees in 1991, 60.000 people have applied for becoming refugees in the country and over 3.000 people have been granted the status, most of them originating from Chechnya or the Balkans. Although numbers are margin compared to the huge migration streams e.g. across the Mediterranean, and, along with that, the refugee quotas of other European countries, major problems appear when it comes to the administration and integration of refugees in Poland. 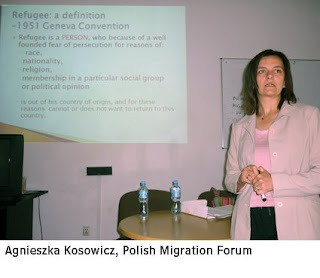 The lack of a coherent migration and integration policy leads to random decision-making based on each individual cases, which let us Fellows come to the conclusion that from the government point of view there is still a long way to go until Poland is ready for embodying different foreigners seeking protection in Poland, and multiculturalism as a consequence thereof. When we look deeper into Polish society in terms of the Vietnamese minority, Dr. Teresa Halik pictures their story as a division into forced and voluntary migration. As young middle-class citizen they use already existing „migrant nets“ in Poland to seek for a better future in economic terms. Interesting to us, the Fellows understood the Vietnamese community as an extremely proud and conservative society in terms of traditions which is, on the other hand, well-integrated into Polish society. This is partly due to a economic win-win-situation for Vietnamese and Polish society as well as we found out due to the common catholic belief which plays a major role when it comes to shared values. Moreover, the Fellows discussed intensively the different perceptions of life in a Confucianism compared to a western model of society and the role and categorization of Human Rights according to these terms. Interestingly enough we examined the different shapes of „duties“ and „rights“ and its reflection in nowadays Vietnamese and Polish society, which gave us all an enriching perspective and more food for thought. 1.) On what basis to grant a refugee status? 2.) How to prove the need to be given a refugee status? 3.) What should the status of refugee entitle to? 5.) How to treat applicants during the application consideration process? To our all surprise we found out that both parties, government and refugees, were e.g. advocating for an immediate temporary work permit for refugees in order to allow a better integration into local society as well as to take off part of the financial burden from the state as fast as possible. In a second phase Fellow’s had organized a role play in order to get a better practical experience and understanding of what it means to decide on individual refugees cases. In order to perform this, seven examples were given from which a „court“ out of the group had to decide in favor of only three cases. This was a good conclusion of the day for us incorporating also the first session in the morning and making the day complete. Topping this rich day full of thought and experiences off, we had - in line with the topic of multiculturalism in Poland - an intercultural evening altogether. Organized for us by the HiA staff in Warsaw, this was taking place in a private flat and we had really great fun! Divided in our four groups of origin (Germany, Poland, Ukraine, USA) we came up with small and funny presentations of our home countries involving the whole group and then enjoying ourselves taking the opportunity to socialize even more and learn to appreciate the colorfulness and diversity of our group, which was great! June 18 (Thursday), 2009. This day was devoted to women’s rights, disabled and LGBT persons’ rights as these groups of society are still discriminated in contemporary Poland. The first guest was Dr Agnieszka Graff-Osser, feminist, scholar and the author of the first feminist best seller in Poland, «A World Without Women», who told about gender issues in today’s Poland: the historical background about gender and transition to democracy in Eastern Europe, facts about women and work, law, politics changing perceptions. During socialist regime, feminism was associated with communism and bourgeois theory. Dr Agnieszka Graff-Osser mentioned, Polish contemporary society is still unequal for men and women in political and public spheres. One of the reasons is retraditionalization «as reaction to the «fake» feeling about gender equality under state socialism». Poland has this special feature of a great influence of Catholic Church on the state and its important role in Polish patriotic tradition. The religious aspect of perceiving women in a society manifests itself in a myth of a self-sacrificing woman as mother, «I don’t sleep and I wash the floor. Women tell jokes about childishness of men – if you imagine man as somebody who can not hold the baby, you’re stuck holding the baby…». As a result, according CBOS’s survey, in 2009 39% women think that the life in Poland is better for men, 48% - the same for men and women, 7% - better for women. The wage gap between men and women in Poland is 22% and 31% in best-paid groups. Women are better educated but more often unemployed than men. The question is still unanswered: «What should we do for destroying «gender pyramid», «glass ceiling» and «sticky floor»? In next meeting we encounter what means double jeopardy of being both disabled and a woman. The workshop with Jane Cordell, who is the First Secretary at the British Embassy in Warsaw, was devoted to discussions on the solutions for incorporating women with disabilities successfully into the workplace in Poland; the types of discrimination of these women; the role of social, religious, cultural norms in improvement the situation of people with disabilities. One of the workshop activities was a discussion what kind of skills disabled people can gain trough an experience of exclusion, isolation, discrimination, social hostility and dependence they predominantly face. Jane Cordell may be one of the best examples of women’s activism and the human’s self-power. 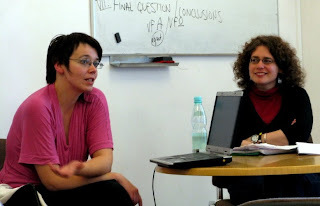 The meeting with Agnieszka Weseli, sexuality historian and publicist, queer activist, member of UFA collective, was a different sort of an example for HIA fellows that «invisible» groups not only exist in Poland, but also act and struggle for their rights to be equal members of Polish society. Nowadays, the LGBT-community still struggles to organize itself and to reach out to politicians. Nevertheless, the active members of this community try to eliminate homophobic rhetoric present in the public opinion. Every year LGBT parades in Poland endeavor to support ideas of equal treatment and rights regardless of sexual orientation. At the end of the day, the fellows discussed the main problems about the present women’s rights and LGBT rights. From my point of view, this activity helped to realize a role of minorities’ community and activism. If we want to improve the situation in Human Rights’ sphere, we should start to change our attitude and ourselves to people who differ from us. In conclusion, I would want to share my own life value: «We are different, nevertheless, we are equal». We should deeply realize that our society loses great potential for its development when it limits the possibilities for self-realization and for people considered as minorities on different basis. Following on the heels of yesterday’s program, today’s lectures and discussions presented the opportunity for HIA fellows to engage with questions of social exclusion, inclusion, and integration in contemporary Poland. Building on an extremely informative lecture on the legal status of national and ethnic minorities by dr. Renata Włoch a sociologist at the University of Warsaw, we began to grasp the complicated terms of this debate. Understanding that the definition of “minority” is highly limited, we began to ask more challenging, grounded questions about the state’s role in integration and protection of “minority” cultures. As most foreign HIA fellows will be quick to point out, the streets of Warsaw reflect the larger demographic reality in Poland: it is an exceptionally homogeneous nation, with some 95% of the population identifying as Catholic, ethnic Poles. But as our lectures have continually reminded us, this is a relatively recent, and entirely explicable, phenomenon. Most immediately, the ravages of the Holocaust emptied Poland—and nearer to home, Warsaw—of its thriving Jewish population, as we acknowledged last Friday in our visit to Treblinka. But to accept Poland’s homogeneity as the end of the story would be a grave mistake, as our first lecturer was quick to point out. Since the fall of Communism and the establishment of a democratic state, the status of minority populations has become central to Poland’s own national identity. The Polish Constitution enumerates the rights of minorities, but the most difficult question arises when one attempts to classify who, exactly, makes up a “minority” culture in Poland today. The controversy is perhaps best seen in the 2002 National Census, which asked two questions for the first time since 1946: first, one’s national identification; and second, the language one spoke at home. Given the responses, the census concluded that upwards of 96% of the nation were of “Polish” identity, with a mere 1.23% identifying as an “other.” Subsequent estimations found this figure to be two or three times as high; nonetheless, the figures suggest that minority populations in Poland—while a miniscule percentage—demand attention, not as a demographic or number, but as individuals attempting to live in the Polish nation while preserving a strong linguistic or cultural heritage. Perhaps most significantly, we had the chance to discuss the difficulties that arise from a 2005 law determining legal minority status in Poland. One provision of the law seems particularly problematic: one’s ancestors must have lived in Poland for at least 100 years. As numerous fellows immediately recognized, such a provision automatically excludes new populations such as the Vietnamese (unofficial) “minority,” while privileging long-established national and ethnic groups such as Germans, Slovaks, Ukrainians, Jews, and Roma. Moving from legal discussion of minorities in the morning, we narrowed our focus to one specific case study in Polish tolerance and integration: the Roma community. Our expert was Dr. Andrzej Mirga, an ethnographer and chairman of the Project on Ethnic Relations Romani Advisory Council. Hosted by the human rights/Roma and Sinti office of the OSCE (Organization for Security and Co-Operation on Europe), the fellows delved into the problems that continue to confront the Roma community—both in Poland, and across Europe. Stateless for over a millennium, the situation of the Roma is unique and challenging for modern nation-states; in Poland, particularly, the population is small and highly dispersed, yet central to understanding the state’s approach to issues of minority rights and integration. Poland’s Roma population has huge disparities in education progress and economic status, and as a linguistically distinct and stigmatized minority, these are hard barriers to overcome. As the sun began to set, we headed over to a bar to meet with several young representatives of minority groups in Poland. From Belarussian to Vietnamese students, Chechen, Russian to Jewish activists, these young people are actively engaged in fostering a multicultural Polish state through dialogue, work at migrant centers, and meetings with students like us. From a legal, abstract framework in the morning, the day gradually brought us here: to the personal, day-to-day realities of “minorities” in Poland. Today, the fellows spoke with Polish human rights activists to understand how the civil sector acts upon the societal issues discussed thus far in the program. Magda Szarota, the program coordinator, suggested the primary goal of today’s program was to assess two related questions: 1) What role do organizations play in promoting human rights? and 2) How are such organizations changing the social and political climate in Poland? 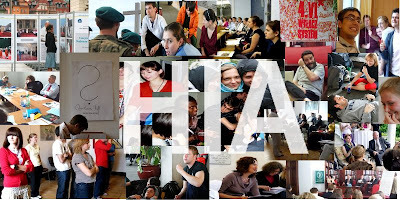 The program began at the Helsinki Foundation for Human Rights, an umbrella human rights organization that litigates cases on behalf of underrepresented populations, monitors government activity with respect to human rights, and educates individuals on related topics. Dr Adam Bodnar, a lawyer and Board member for the Helsinki Foundation for Human Rights, spoke about the history of the organization and the Polish experience with human rights violations. The foundation began as a committee during Communist Rule, when a group of activists clandestinely published reports highlighting human rights abuses under martial law. After the fall of communism, the committee immediately became a recognized organization with a continued commitment to protect human rights. In addition to issues with communism, Mr. Bodnar highlighted other prominent human rights issues in Polish more recent history including: lustration laws under the Kaczynski twins, criminal defamation with relation to journalism, involvement in the Iraq war and representation of Roma minorities. 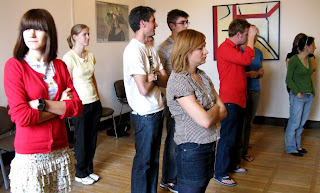 The Association for Intercultural Dialogue is an international platform where students from France, Spain, Poland, Azerbaijan, Armenia, and Georgia cooperate to foster mutual international understanding. Representatives from the studio of simulation games then explained their effort to design games that foster cooperation within NGOs, businesses and other organizations. To illustrate the mission of the organization, the fellows were asked to participate in a simulation game. Each participant decided whether to take the train or a car to work from a remote village in the mountains. Those that took the train received 5 points each round, while those that chose the car received 15 points. If more than 40% of the group drove, however, those that chose the car received 0 points. The HIA fellows appeared to be surprisingly cooperative, as most people benevolently continued to take the train until the last few rounds. The day concluded with a seminar that examined the role of corporations in the struggle for human rights. Using the Agora Foundation as a case study, fellows considered questions such as: To what extent should corporations benefit from socially responsible efforts? How should a company choose which issue to address? Agora Foundation is a philanthropic branch of Agora Media, a media conglomerate in Poland. The most prominent subsidiary is a newspaper entitled, “Gazeta Wyborcza” signifying “Election Results” in English. The newspaper emerged after the Solidarity movement in 1989, and is widely regarded as the most popular newspaper in Poland. Using the newspaper as a platform, fellows discussed what role a news organization should play in human rights. Should it report on certain issues to raise awareness? Can the newspaper be an effective medium to initiate social campaigns? Bearing in mind these examples of activism, tomorrow the fellows will discuss the minority situation in Poland and how to move forward. The Monday, June 15th, started with the tour of Sejm and Senate. The day was packed with discussion on civic society and the role of human rights within foreign policy. The day finished with the reception at the house of Deputy Chief of Mission of US Embassy. Our visit started with the visit to Polish Parliament. The guide gave the group a short overview about the History of the Parliament. The Senate can be traced back to a council of royal advisors. In the Nobles' Democracy, the Senate was a Privy council rather than an upper chamber of the Sejm, and consisted of members of the royal cabinet and the royal court, together with voivods, prefects and castellans (all appointed by the king), and Catholic bishops. In the Second Polish Republic, senators were elected by universal ballot. After a referendum organized in 1946 by the Communist regime, the Senate was abolished in the post-Second World War People's Republic of Poland. It was only re-established after the fall of communism in 1989. The building was destroyed during the Second Word War and than rebuilt. Nowadays, the term in office of a senator is four years. There are 460 deputies in Sejm. The Senate may reject or amend the bills passed by the Sejm but any rejection or amendment may still be overruled by an absolute majority vote in the Sejm. A joint session of the Senate and the Sejm is known as National Assembly. Senators are elected by a plurality bloc voting method (rarely used in the world, often used in U.S. ), where several candidates with the highest support are elected from each electorate, and each voter selects their whole preferred set. The exact number of senators from each electorate is dependent on its population and varies from two to four. After our visit to the Parliament Judy Goldstein greeted the group and updated us on happenings of other groups in Europe. (France, Denmark, Netherlands). After this Magda Szarota gave a short introduction about to where we are now in the program. She pointed out that we are moving now towards the present issues concerning Polish society but we should not forget about the historical background and the relevance and significance of it today. Magda stated that neither pluralism nor freedom and peace can be taken for granted. We as the citizens should always be aware and explore ways and means of how to make this change. Later on Monika continued with the introduction. She posed a question: is 20 years of democratic Poland is enough to form a strong foundation for a democracy that is defending human rights. She also raised the heatedly debated issue of what to do with the people that collaborated with the communist regime (lustration). She ended up her presentation with the remark that Poland tends to see itself as promoter of democratic movements in the area, however its perceived as an outcome of the past and lack of diplomatic skills. Then we had a discussion on civic society and what this term actually means to each of us. It turned out that we understand it in different ways. Some of us emphasized the role of NGOs or that this sector is independent from government. Some raised the issue that funding for NGOs should not be provided by government and there is a notion of mistrust between the two sectors while some others argued that cooperation with government is crucial for the development of the civic society. Later on a lecture on “Are human rights foreign to foreign Policy? 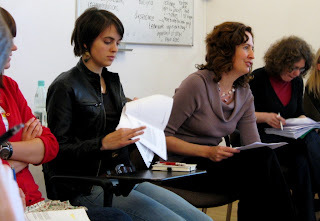 Common and opposite interest!” By Agnieszka Misala from the Warsaw University took place. She claimed that human rights should be in the common interest and a condition of security. She talked about the dilemmas of countries which pursue a foreign policy involving human rights. The activity of Poland in the commission on Human Rights was also talked over. The fellows discussion was the next part of the program. It was a pro-against debate on following statements: “Human Rights are Universal and Independent of National Status”, “To make use of civil and political rights citizens must first be provided with social and economic rights”, “Real Politik (National Interest) is the only reason for human rights foreign policy”. The debates were vigorous and fellows presented an array of different opinions. After the exiting discussions the fellows left the Palace of Culture and Education and went to the HIA reception hosted by Pamela Quanrud, the Deputy Chief of Mission at the Embassy of the United States of America. Current fellows mingled with senior follows and diplomats and talked about the future of HIA, and the role of HIA in Poland. The host and Judith Goldstein, Executive Director of HIA USA, Ambassador Janusz Reiter, the Chair of the Programming Board of the HIA Poland, as well as two HIA Senior Fellows from Poland and USA made their remarks. It was a great evening! Multicultural Warsaw in the past v. homogeneous Warsaw nowadays? On Saturday, June 13th, HIA fellows had opportunity not only to discuss the issues concerning the Polish history and Polish minorities nowadays, but also to feel and compare the difference between the present and the past. HIA fellows started the day with three active exercises of which aim was to perform the mid-term evaluation and asses what phase of the program was already reached. The first happening with LGBT people representation took place in Poland in 1998, when three masked people stood on the Castle Square. Nobody even thought that a gay and lesbian open-air festival could be organized in Warsaw. Three years later, on the 1st May 2001 300 people walked down the streets in the first parade. There were only one rainbow flag and everything was quickly organized. But in 2004 the Parade didn't took place. The mayor of Warsaw, Lech Kaczynski, didn't permit to organize the event – as he declared - to protect the morality and religious convictions of the inhabitants. The responsible of the parade protested but at least, an on place event was organized that gathered 2000 people. The Warsaw Pride theme for 2009 was “40 years of Equality, 20 years of Freedom”. Despite the changes in the political system 20 years ago, homosexuals in Poland are still discriminated. LGBT during the parade had three main demands: possibility to register a legal partnership, enacting a law against hate speech and creating educational programs about homosexuality at schools. Fortunately, there weren’t any serious contra-demonstration organized (nothing strange – though I haven’t seen the police in such number for a long time in Warsaw), so HIA fellows could, with other participants, calmly take part in this colorful (but also rainy) celebration. After lunch time, HIA fellows participated in a tour of Warsaw, entitled “ What Went Missing That Cannot Be Missed”. The guide - Ewa Bratosiewicz – not only showed the most well known and popular Krakowskie Przedmiescie Street - the most elegant street of Warsaw, along with mansions and farms of noblemen, and since the XVII century, palaces and residencies of magnates, surrounded by gardens as well as churches with cloisters were built - but also tried to present Praga as the most interesting part of Warsaw. Warsaw’s eastern suburb, during WWII destroyed only in 15%, Praga has long been regarded as off-limits to Western visitors. Often painted as the bastion of tower blocks and the criminal underclass, the area is actually enjoying a snail-like renaissance, and as such offers visitors a combination of art and past-multiculturalism in Warsaw. HIA fellows contrived to visit the place, where the oldest, circle-shaped synagogue in Warsaw had been, the school were Janusz Korczak (a Polish-Jewish children's author, pediatrician, and child pedagogue, murdered In Treblinka) had been studying and the building, where David Ben-Gurion (the first Prime Minister of Israel) had lived during his study. One of the most unique way of commemorating the past in Praga is Kapela Podworkowa Monument. The tradition of cloth-capped buskers goes back a long way in Warsaw, and the best loved of the lot have finally been commemorated in brass on the other side of the river. The pre-war Kapela Podwórkowa are a bit of a local legend in these parts, and now the five piece band have been honored with a noisy monument sculpted by Andrzej Renes. Nothing remains of the Nazi death camp at Treblinka. Before World War II ended, the Nazis essentially accomplished their goal of exterminating Polish Jewry. In the aftermath of the Katyn massacre (done by Soviets and discovered by Wehrmacht), they were mindful of the need to cover up atrocities and so razed the camp’s facilties, ultimately converting the grounds into a farm operated by Ukrainian former guards. Because of this, when we traveled to the site of the death camp on Thursday, we did not see any structures or materials from the time of the camp’s operation. Instead, we were confronted by a beautiful green field and a number of Communist-era stone memorials. Our guide, historian Tomasz Cebulski, led us around the site and told us the details of the camp’s operation. Almost all of Warsaw’s Jews were killed at Treblinka. Prior to our visit, Mr. Cebulski emphasized the rich cultural heritage and long history of Warsaw’s Jewish population. Learning about the lives that were taken at Treblinka put the history of the camp into a compelling human context. Mr. Cebulski also screened a video documenting life in the Warsaw ghetto, where Warsaw’s Jews were forced to live for several years before being sent to Treblinka. We know what happened at Treblinka only because of the testimony of the camp’s few hundred survivors. Cattle trains packed with people brought Jews from the ghetto to the camp. Many prisoners died on this journey: cars that should have held around fifteen people carried more than fifty, no food or water was provided, sometimes the trains would sent on the tracks for days, waiting for trains carrying military freight to pass by. Those that did survive the journey to Treblinka were killed within hours of arriving at the camp. A few traincars at a time would unload their contents on the Treblinka platform. Prisoners were forced to strip off their clothes and relinquish their valuables. They were then herded into gas chambers and poisoned with carbon monoxide. Treblinka was a model of Nazi efficiency. Because calm people were easier to kill, prisoners were told they were not in danger until the moment the gas chambers were sealed. They were given receipts to claim their valuables later on. An orchestra played during camp operations. Prisoners were informed that the gas chambers were showers. Treblinka could kill around 17,000 people a day. These horrors are not evident at Treblinka today. We visited a small museum and then walked through the woods to the site of the atrocities. It was a clear and peaceful day. In the main clearing, about 17,000 stones, roughly cut and unsculpted, stand above Treblinka’s mass graves. At the location of the camp’s gas chambers, a large stone column has been erected. The column is capped by a scuplture representing human forms in torment. Above these tangled shapes, two hands open downwards in blessing. We had a short discussion next to this monument. Many of us were surprised by Treblinka. Maybe we had imagined a visually arresting place with horrors on full display. We decided that Treblinka created a special and important space within which we could consider the atrocities of the Shoah without being unproductively overwhelmed by shock, sadness or disgust. As the site of a successful genocide, Treblinka demands to be remembered and hallowed, but, with its simple yet profound memorials and disarming natural beauty, it does so on human terms. Educational and Cultural Affairs, Office of Citizen Exchanges.